Do I have Thoracic Outlet syndrome? What should I be doing? I am going to do my best to let you know my symptoms but bear with me that my "injury" seems to be ever evolving and very complex. A little about myself. I am a 26 year old man who lives near Vancouver BC. I am an avid rock climber and it is how I spend all of my free time. I have been climbing for about 3 years and it has brought me from depression and anxiety to really having something to live for and focus my energy. Going into the mountains and even the climbing gym brings me more joy than anything else has in my entire life. Ok so now I am injured and cannot climb or go into the mountains and my depression and anxiety is creeping back. I have no problem admitting this and admitting that I feel very desperate to get better so any information is useful! About 6 months ago I was climbing hard steep routes. 3 days of hard climbing and I skip a rest day and decide to go out with a novice climber and climb easy routes with them all day. On one of the climbs I felt two distinct pops in my finger while crimping down on my fingers. They did not hurt and I shook it off and continued to climb for the rest of the day with no pain. The next day I felt okay. Something may have felt a little off but nothing to draw enough attention for concern - I was on my 5th or 6th day of climbing in a row and its pretty normal to feel tired and worked. So the next day comes, I warm up on an easy climb and then proceed to complete my hard climb I have been working on for days. It felt great. With all this adrenalin I decided to move onto an equally difficult climb that my friends have been working on. About 30 feet up something feels off in my hand and finger I get lowered to the ground and decide to call it a day. The next day when I wake up my entire arm is in pain and very swollen. Its generally painful and feels very crappy. I guess it is now that I should mention that at this time I was currently seeing a chiropractor to try and relief some pain in my arm that can be described as 5% of what I was feeling when my arm was very swollen. I treated this swelling with ice, rest, and self massage. My chiropractor diagnosed me with a bad case of tendinitis and tried to get me to pay 500$ for cold laser therapy. I began to lose faith in this chiro and everything she did seemed to make my neck and back sore. For the next 2-3 weeks I rested and treated myself with ice and self massage. I then left on a climbing trip that had been in the works for months. My symptoms were still there but it felt somewhat manageable. The style of climbing down there was different than crimping down on small holds. It was almost all crack climbing - keeping my hands and feet in the crack that was right in front of me for the most part; no long reaches, very little crimping and pulling down hard on my fingers. Mostly just jamming my arms, hands, fingers, and feet in the crack and trying to go up! Although I never really felt 100% I was able to climb the whole trip with taking a few extra rest days here and there. So once I got back from this climbing trip it was time to buckle down and fix what has been going on with my arm for months, arguably a year. I began so see a physiotherapist. We decided that I had poor posture; my shoulders were rolled forward, I had tight pecs and poor mobility in my shoulders. This is when I really started to experiment with what positions would give me pain cause the swelling in my arm. When we tired to stretch out my pecs it was realized that if I were to stretch my right pec I would get a rush of pins and needles in my hand, my arm and hand would start to turn white and after about 10 seconds the pain would start and it would come on fast. Within a few more seconds I need to relax my arm or it feels as though its going to explode. I can duplicate this sensation a few other ways but I will leave that for the end of this write up in a paragraph where I describe all of my current symptoms. So my pecs are tight but I can't stretch my pecs. I am referred to another physio that specializes in IMS(Intra muscular stimulation). She is the first person to start talking to me about Thoracic Outlet Syndrome. She pokes me with her needles, tells me about TOS and the brachial plexus and the first rib. So I start exploring that area with my fingers and I find a lump above my right collarbone. It's about 2 chickpeas large and feels sort of like it is attached to my scalene muscles. She dismisses it as probably nothing but I go and see my family doctor about it. She tells me its a swollen lymph node and orders an ultrasound and blood work. She murmured a couple things about possible cancer and tumours. The ultrasound and blood work both come out negative for anything of that nature except 1 small mystery. My blood tested slightly positive for "mono". My doctor says she has never seen this before but it is nothing to worry about. All of these tests may not even be related to my injury but I don't want to leave any details out - and this lump still remains a mystery to this day. So all of this somewhat brings me to the present (January 29 2016). I am currently still doing my shoulder mobility work, I am seeing a massage therapist who is trying her best to treat my symptoms. I drive heavy equipment at work and am using my right hand and fingers to operate controls. I always have an ache in my arm and I can never shake it. Unfortunately my pain is not something I can't go a day or even an hour without thinking about. I can barely work, I can't climb, I can't workout and there is no end in sight. I have an MRI on my brachial plexus scheduled for the end of April but don't really have a reliable doctor who is going to look at it and tell me what is up. Maybe that will come with the MRI itself but I don't know. My family doctor is great but I don't think she has really dealt with many sports injuries, especially one as complex as mine. She's pretty good at delivering babies I hear. So hear I am trying to figure out what in the world I should do! -Right arm is always somewhat swollen and tender. Ice and massage seems to do little or nothing at all. -Tight muscles from my shoulder and subscapularis all the way down my arm and into my fingers. Triceps is one of the worst. Scalene muscles are also visibly tight on my right side. Easily seen if I tilt my head to the left. -Fingers feel weak and my arm can get tired from something as simple as brushing my teeth and thousand different simple day to day activities. -Raising my arm above my head and stretching my right chest muscle causing my arm and hand to turn white very fast, within seconds. This is especially bad when my arm and shoulder are externally rotated. This is accompanied by a loss of pulse measured in my wrist. -A very deep breath in and held causes almost the same pain and raising my arm or stretching my chest. I could describe it as an electric fence has replaced my ulnar nerve and is slowly getting more voltage - again the feeling of my arm going to explode. It feels like it originates in my armpit. -Tight band running from my coracobrachialis area down to my elbow. Flicking this band it sort of like hitting my funny bone. It sends a jolt down to my fingers. I can sort of mimic this on my left side but it is more difficult to find and not as easily aggravated. -Standing upright against a wall and mimicking a shoulder press motion causes some tension to build up and release when coming down- with a similar feeling to flicking that band in my armpit. A bit of a jolt to my fingers. Whew what a write up. Im glad I have all of my thoughts in writing. If you want to contact me by email feel free. This site feels a little old and outdated and I am not sure if it is still active but if this message reaches you I would be extremely grateful to hear your thoughts. Comments for Do I have Thoracic Outlet syndrome? What should I be doing? I have TOS on my left side. I didn't get mine rock climbing, but swimming. I got a blood clot which I wasn't aware of until later. I don't know where you are on this but I would go to a vascular doctor. You need an ultrasound to see what the blood flow looks like in the area. That should get them started at least. I would even google to find docs in your area that treat this. You may also have the lumps in the area which I do not have. They could be pushing on some of the structures in the area and causing problems. And I hope they are benign. There is a surgery for it (TOS), but do your research before jumping into it. You want a very good surgeon with lots of experience if you go that route. I have not had it. I have had some success with massage, stretches, posture work etc. But I still get flare-ups from time to time. And, unfortunately, I no longer swim but hope to one day. I doubt the swimming was the cause of your blood clot; hence you weren't immediately aware of it. I'm sure the vascular surgeon has made recommendations; it's a serious problem and not for a chiropractor to treat. Dude, careful man - just got out of hospital for a pinched off vein in the subclavian area that sent blood clots up my neck and into my lungs. Same as you super active climber in mountains and thought I my right arm would get more "pumped" while placing gear etc. This is no joke; had the same symptoms and am now out of climbing and all exercise for a while due to blood thinners. Go see a vascular and thoracic surgeon - they will be able to help you don't ignore like I did for a year plus. My symptoms are exactly the same. Your story and symptoms are exactly the same as mine except swap rock climbing for weight lifting. I even went and had an ulnar nerve decompression. Please reply if you wish to make contact. I'm battling my own complex musculoskeletal issues in the same area that in many ways resembles a milder version of yours. Very curious to know if you've learned more since you last posted here in January. Actually a very active site, but this page, you're right built a few years back. Your's is a complex and unusual case of TOS, yes, I think you have TOS, too, but yours is different. Firstly, when you raise and extend your shoulder, and the pulse ceases and your hand goes white is called Wright's test; it suggests the artery (and possibly the brachial plexus too) are being impinged by the Pec Minor tender. Google it. The strength of the fingers, in particular the PADS and DABS and opposition of the thumb and pinkie need to be tested in that position, and compared with when it's in the normal position. There are two features of particular concern. 1. The swelling of your arm. The common TOS that chiropractors treat on a daily basis involves the artery and brachial plexus, and you have signs of those. But in addition the vein is being affected, hence the swelling in your arm. Usually the subclavian vein does not pass through the inter scalene triangle, though apparently in a small percentage of people it may. 2. Those lumps above the collarbone. They need to be followed up, and in my opinion perhaps a biopsy done, certainly if there are changes in the bloods, or if you have any others in the groin, tum or chest. Any masses in that area can certainly affect the thoracic outlet. Have you had a chest x-ray? Has an x-ray of your neck been done? A large cervical rib can do very odd things. In short, I think you need an opinion from a thoracic surgeon. In fact, with a swollen arm I would not have accepted you as a patient until that had been done. Please keep in touch. I feel the correct diagnosis has not yet been reached, hence your lack of real progress, and my curiosity is getting the better of me. 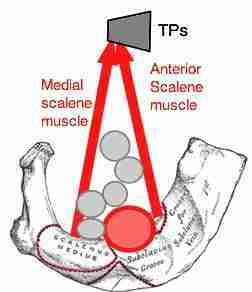 Chiropractic Help homepage»Inter scalene triangle » Do I have Thoracic Outlet syndrome? What should I be doing?